Do you own a carseat? Do you have children that require to be seated in a carseat? Are you wondering if your car seat is installed correctly? 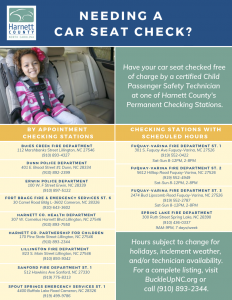 There are several locations around Harnett County and surrounding areas that have permeant child safety seat check stations. Buies Creek Fire Department is a permanent checking station by Appointment. Call 910-893-4327 to get your carseat checked today.